For something so healthy, it is a wonder that I find myself craving it so often! 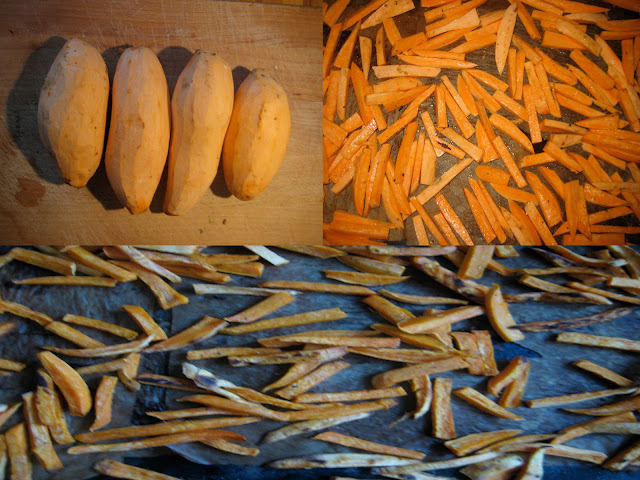 Sweet potatoes are high in Vitamin A, C, manganese, beta carotene and antioxidants. Sure, if you steam them, these nutrients are at their highest, but baked is more enjoyable because it's chewy and tender and slightly crispy around the edges. For years and years I tried to make 'crispy' sweet potato fries in the oven, but sweet potatoes have too much moisture to do what regular potatoes do, so you can't have it crispy, unless you deep fry. Once I got over trying to get them to be crispy, I started to appreciate them for what they are. My favorite way to enjoy these is as a side with Jerk tofu and coconut rice. I make this meal almost every week! I can't help it, it's so delicious and so different and so flavorful and spicy. 3. Arrange on a baking sheet lined with parchment paper and add oil, salt, pepper, chili flakes and herb de provence. Mix until coated and bake for 10 minutes, then flip and reduce heat to 200C/425F and cook for another 5 minutes, until uniformly colored. 4. Turn off oven and allow to sit for 10 - 20 minutes so that they dry out a little. This allows them to achieve a perfect chewy texture.